Recipes from North Eastern states of India were the toughest to find in this alphabetical journey of Indian states. One reason is the there aren’t many on-line sources. Second is because the cuisine is mostly non vegetarian. The third thing is that the vegetables/greens used for cooking in NE are mostly local and not available in the rest of India. Assam and Manipur recipes were comparatively easier to find. But for Manipur, I checked with my neighbour for a doable lunch menu. Again, what you see here is what was available in my pantry that day. She suggested a dal kind of gravy- called Uti/Ootti. It can be made with dry yellow peas or with green peas. Most on-line resources show recipes for the dry peas. I too had some with me, which I thought would use up this way. In South, people usually eat rice with veggies on the side. It’s called palya in Karnataka, thoran in Kerala, porial in Tamil Nadu. So if the veggie used is cabbage, it’s cabbage palya/porial/thoran. If it’s beans, then its beans palya/porial/thoran. The Manipuri side dishes are called Kangho. The one here is potatoes and green peas combination. The aloo kangmet was quite easy to prepare. Fry red chillies, fry onions and mash it all with cooked potatoes. You are done! It’s slightly spicy, so you need to adjust the chillies accordingly. Chamfoot is boiled vegetables. It’s like a simple salad. My neighbour told me that sugar can be added if you find the taste too bland. Aloo Kangmet : Boiled potatoes mashed with fried red chillies and fried onions. 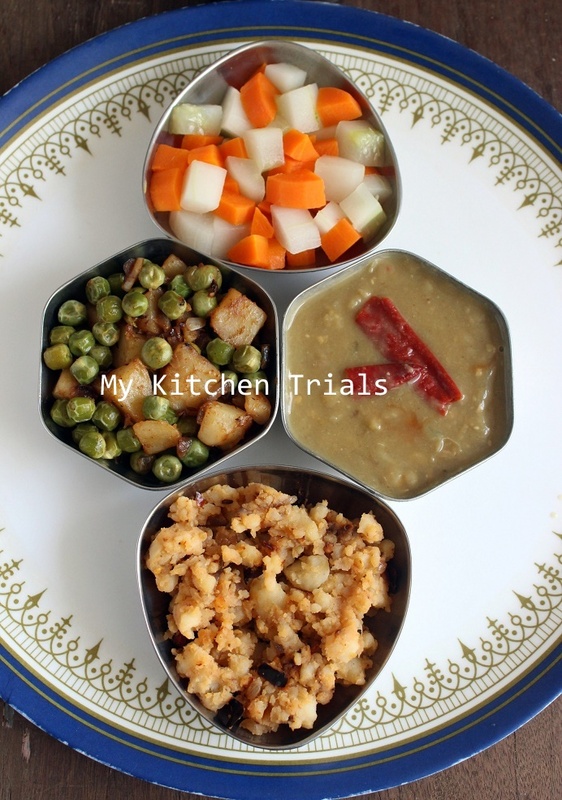 Uti (Ootti) : Pressure cook 1 cup dry yellow peas or fresh green peas with sufficient water along with a spoon of oil, 1 or 2 green chillies and a tablespoon of rice. Once its cooked and the pressure is released, boil the cooked mix for a couple of minutes. Add 1/2 tsp cooking soda and boil again, mashing it well. Add salt, taste test and adjust accordingly. Keep aside. For the tadka, saute chopped onions, couple of garlic cloves, 1-2 red chillies. Add a pinch of jeera powder and coriander powder. Add this tadka to the cooked Uti. 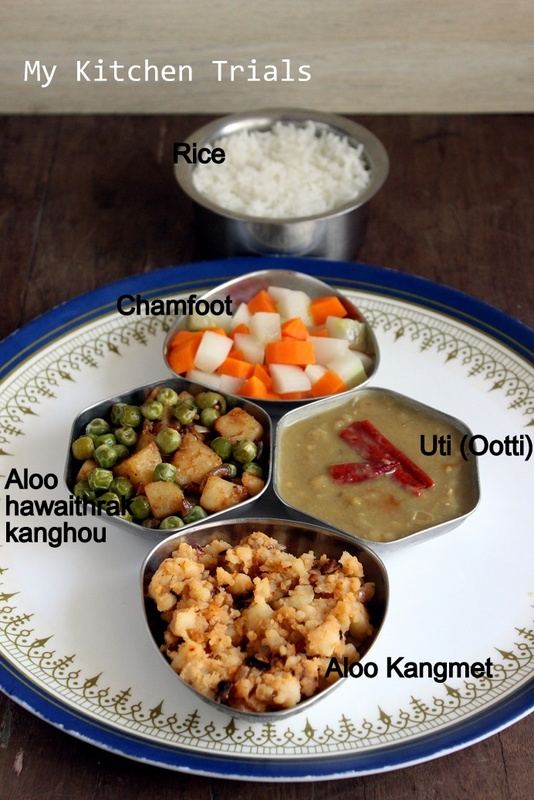 Aloo and Peas Kanghou : Kanghou is the regular side dish. It takes the name of the vegetable used to make it. Like our Kerala thoran or Tamil Nadu porial. If it’s carrot, then it’s carrot thoran or porial. 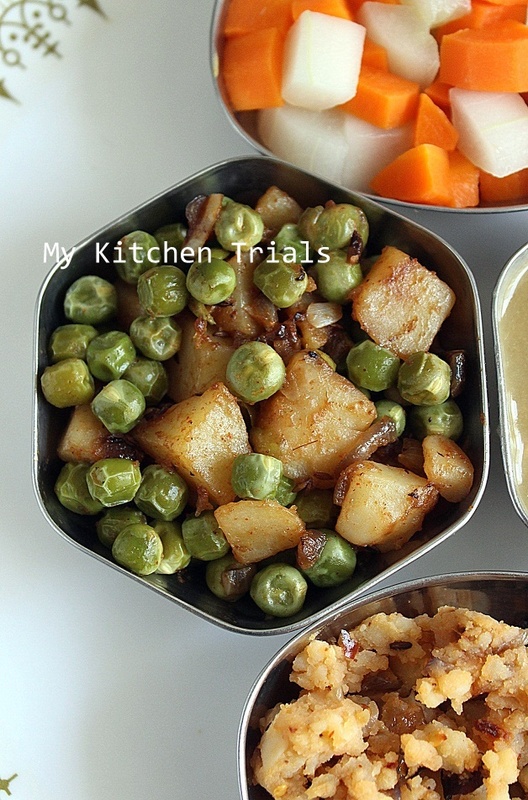 Here it’s potatoes and green peas, because that was all left in my pantry that day!! I have used chilli powder and coriander powder as well in this preparation. Chamfoot : Simple boiled vegetable salad. A combination of carrots, beans, bottle gourd, cucumber is used here. A spoon of sugar can be added, for taste (I didn’t). You could manage a platter for this state too. :) great. Veggies are cooked the same way I guess, through out the region. I cooked a recipe similar to this one today and it belongs to another state. Filling lunch with simple flavors and looks vedy colorful too.you must be really lucky to have a neighbour to give recipe for NE!!! Feeling very J!! Kudos to u Rajani, while we are searching for a single recipe for NE, u come up with a lunch.. Can see loads of research and efforts from ur side. Beautiful dishes there. Nice thali Rajani and a healthy one, I might add. I think we all should shift to your neighborhood…you are lucky to get your recipes from them:)…what a simple yet comforting meal..super clicks as always!! Nice platter. The recipes are all so simple but look so good together. Oh man! a platter for this state as well??? Awesome, Rajani. I always want to know what each category is called or referred in each state as we have our own…very nice efforts Rajani in getting so many dishes for the tough NE as well..great job! 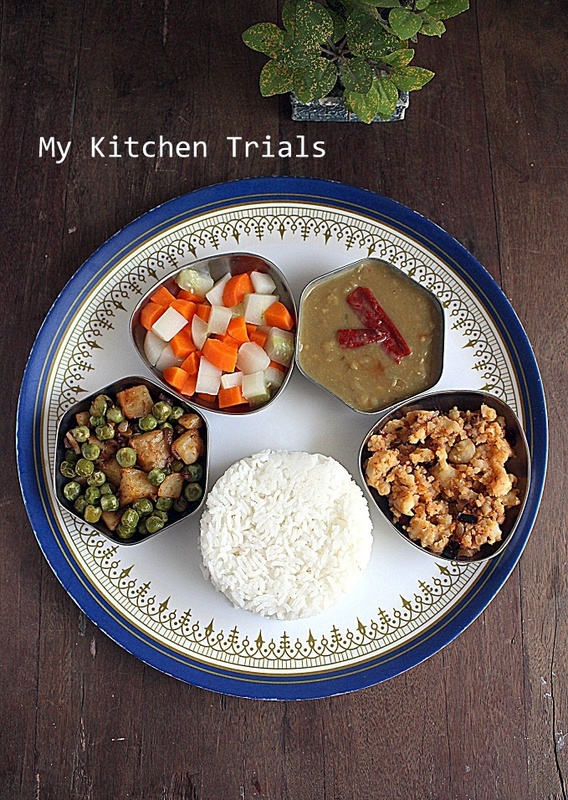 Kudos to you for finding so many amazing dishes from Manipur. Rajani when most of us were struggling to do one doable recipe you have a platter. Sorry adelicious platter. I love the dishes and pics are as usual amazing. Hi Rajani! A foodie from Manipur here! Appreciate the food that you’ve made. Loved your enthusiasm and endeavor. It’s true, most of the vegetarian food cooked in Manipur are all local herbs and veggies. For all dishes major ingredients are chives and ngari (manipuri fermented fish). But Manipuris are proud of variants we have in vegetarian meal than a non-veg meal. I’m sorry but your Utti/Ooty looks like Eromba (Gravied Chutney) to me. At first glance I was wondering why would you make Eromba and Aloo Kangmet together! Both are the same, one is dry and another with gravy (Eromba has ngari, but not in Kangmet). As, I scrolled down I found one pic tagging that small bowl as Utti. It seems your peas are all boiled too much and crushed! Still, like I mentioned, appreciate the entire effort you have put in. Just in case, you can visit my blog https://joyrajwaikhom.wordpress.com/2013/08/02/how-to-cook-ooty-ooty-thongba/ and check recipe on Utti and Eromba. I would love to share a bit of idea as well, the Aloo and Hawaithrak (green pea) Kang-ngou reminds me of my mom. It looks lovely. You have spelt it as Kangho. It should be Kang-ngou. Kangna means dry and Ngouba is to fry, Kangna-ngou is to fry dry or the bhaju and is shorten as “Kang-ngou”! :) Same applies to Aloo Kangmet. Kangna-dry and Metpa-is to crushed. So the boiled aloo are crushed dry with chilly flakes and garnished with coriander and chives.Also, some raw mustard oil to give that pungent mustard taste. Its Kang-met! Chamba means very simple, and futpa means to boil. Simple boil- Chamfut. We usually prefer bigger pieces in chamfut and not small pieces like you’ve chopped. It looks salad to me. So have bigger portions of cucumber, carrots and cabbage. Pressure cooked them. One whistle should do and add suger to taste. You’ll see the difference, and I’m sure you’ll have a better picture for the lunch plate. Thanks alot for trying what you did!! Lots of love from Manipur!